Our coin textured vinyl flooring in metallic beige or metallic silver is aesthetically pleasing, providing a shiny finished look similar to metal. Vinyl Metallic Colored Flooring Rolls are extremely durable even in high foot traffic environments and the coin pattern provides added traction even in wet or moist conditions. Great for use in walkways, laundry rooms, gyms, garages, basements, fitness centers, locker rooms, kennels, boats, trailers, bars, and industrial flooring applications. Vinyl flooring comes in 48" widths in a variety of pre-cut lengths and is also available in custom cut lengths up to 50 feet. This product can be quickly and effectively installed using double-side tape. For more permanent applications this flooring roll can be installed with a polyurethane-based adhesive. Our coin textured vinyl flooring in metallic beige or metallic silver is aesthetically pleasing, providing a shiny finished look similar to metal. 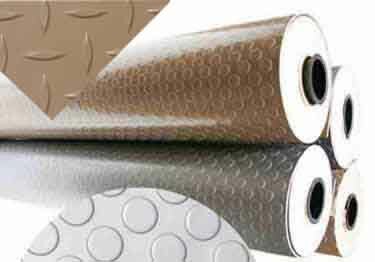 Vinyl Metallic Colored Flooring Rolls are extremely durable even in high foot traffic environments and the coin pattern provides added traction even in wet or moist conditions.